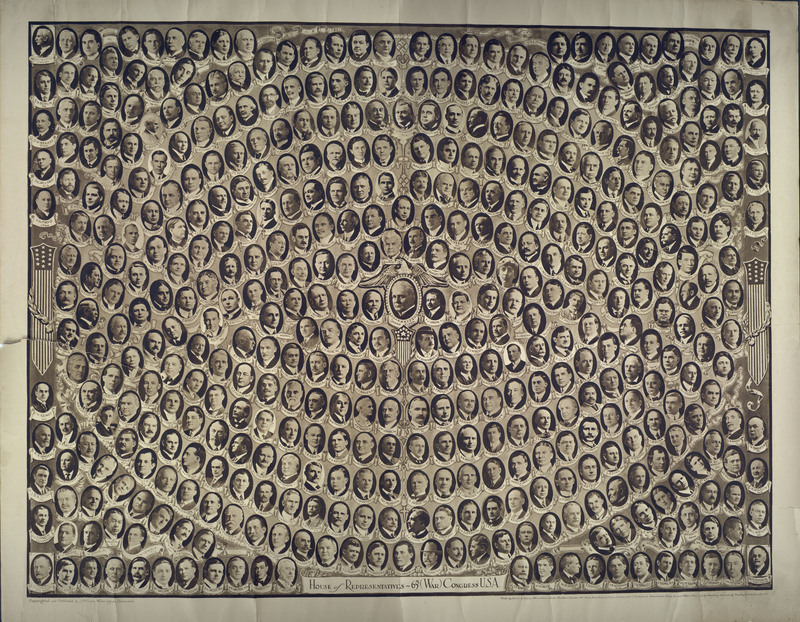 This composite photograph features the members of the United States House of Representatives during the 65th Congress (1917 – 1919). The 65th Congress took place during a period of great change, both around the world and in Congress itself. During the 65th Congress, the House of Representatives voted on the declaration of war that marked American entry in World War I and passed a number of wartime acts. It also marked the first time a woman was elected to either house of Congress. Jeannette Rankin (1880-1973) was educated at Montana State University, attended the New York School of Philanthropy, and the University of Washington. Rankin became a lobbyist for the National American Woman Suffrage Association (NAWSA) and helped women gain the vote in Montana in 1914. Rankin campaigned for a constitutional amendment for women's suffrage and social welfare issues. A Montana representative, she served in both the 65th Congress (1917 – 1919) and again in the 77th Congress (1941 – 1943). 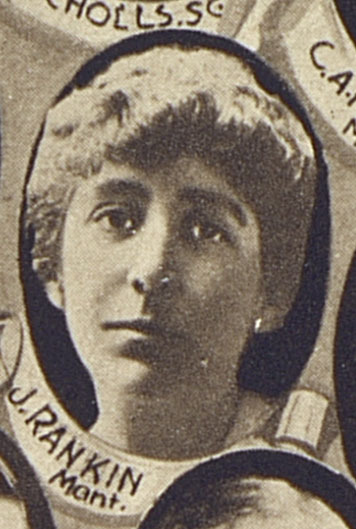 Rankin was deeply committed to pacifism and during her terms in office she voted against American involvement in both World War I and World War II. Rankin's was the only vote against entering World War II and the decision was extremely unpopular. After her term ended, Rankin continued her support of pacifist causes. Eugene Black (1879-1975) was born near Lamar County, Texas. He taught school and was employed in the post office during his youth. Black graduated from the law department of Cumberland University, Tennessee in 1905 and was admitted to the bar the same year. 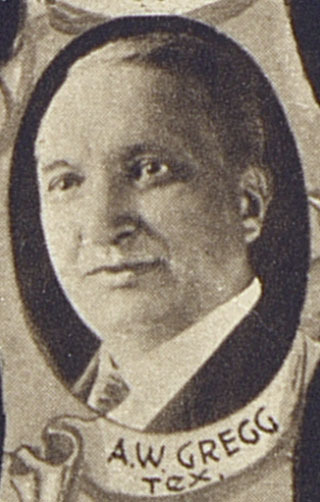 He was elected to the 64th Congress and to the six succeeding Congresses (1915 - 1929). In 1929, he was appointed by President Hoover to the United States Board of Tax Appeals (now the United States Tax Court), was reappointed in 1932, and again in 1944 by President Franklin D. Roosevelt. He served in that role until his retirement 1953, and continued to serve on a recall basis until 1966. Thomas Lindsay Blanton (1872-1957) was born in Harris County, Texas and graduated from the University of Texas Department of Law in 1897. He practiced throughout north and central Texas before being elected judge in the 42nd Judicial District of Texas. He was elected to serve in the 65th Congress and was re-elected for several more terms, leaving office after the 74th Congress in 1937 when he returned to the practice of law. James Paul Buchanan (1867-1937) was born in South Carolina and moved that same year with his parents to Texas. 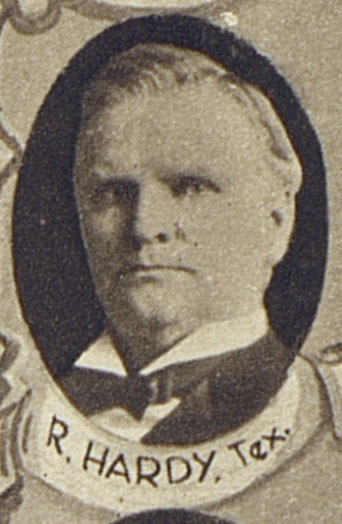 He attended the University of Texas and graduated from the Department of Law in 1889. He practiced law for ten years before being elected as a member of the Texas House of Representatives in 1899. In 1913 he was elected to the 63rd Congress and continued to serve as a representative through the 75th Congress, a total of thirteen terms. 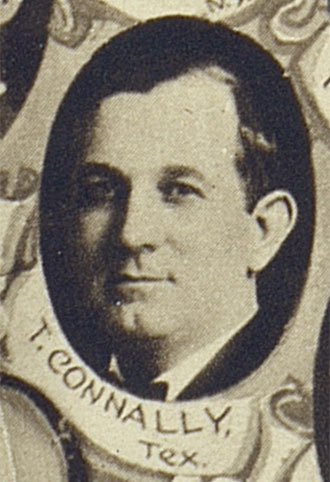 Thomas (Tom) Terry Connally (1877-1963) was born in McLennan County, Texas and graduated from Baylor University in 1896 before graduating from the University of Texas Department of Law in 1898. He went on to practice law and served as a sergeant major in the Texas Volunteer Infantry during the Spanish-American War. He was elected to the 65th Congress and served five subsequent terms. In 1928, he was elected to the Senate and served until 1953, spending the latter half of his Senate career as the Chair of the United States Senate Committee on Foreign Relations. Connally also served as the representative of the United States during the first session of the General Assembly of the United Nations at London and during the second session at New York in 1946. After leaving Congress, he practiced law in Washington, D.C.
Martin Dies (1870-1922) was born in Louisiana and moved to Texas with his parents in 1876. He was admitted to the bar in 1893 and began the practice of law. He was elected to the 61st Congress and to the four following Congresses (1909 to 1919). During the 63rd and 64th Congresses he served as the chairman of the Committee on Railways and Canals. His son, Martin Dies, Jr., also served as a member of the House during the 1930s, 1940s, and 1950s. Joe Henry Eagle (1870-1963) was born in Monroe County, Kentucky and graduated from Burritt College in 1887. He then moved to Texas where he taught school and served as superintendent of the city schools of Vernon, Texas from 1889 to 1891. He studied law, was admitted to the bar in 1893, and practiced law in Witchita Falls and Houston. Eagle was elected as to the 63rd Congress and was reelected to terms in the 64th, 65th, and 66th Congresses. After a break in his congressional career, he was elected to both the 72nd and 73rd Congresses. John Nance Garner (1868-1967) was born in Red River County, Texas. He studied law and was admitted to the bar in 1890. He practiced in Uvalde, Texas and later served as a judge of Uvalde County from 1893 to 1896. 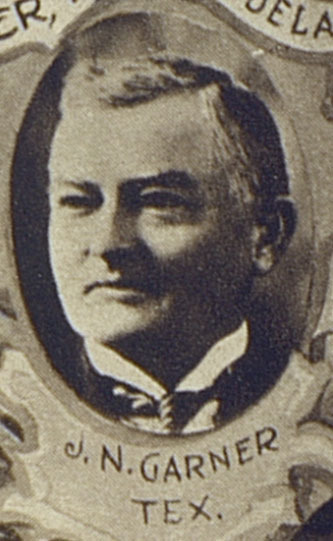 Garner served as a member of the Texas House of Representatives from 1898 to 1902 and was subsequently elected to the 58th Congress and to the fourteen succeeding Congresses (1903 - 1933). During this time he served as the minority floor leader and as Speaker of the House of Representatives. In 1932 he was reelected to the 73rd Congress and, on the same day, was elected Vice President of the United States on the ticket headed by Franklin D. Roosevelt. He served in that office from 1933 to 1941. After his career in the U.S. government, he retired to Uvalde, Texas. Daniel Edward Garrett (1869-1932) was born near Springfield, Tennessee. He studied law, passed the bar, and began his practice in Tennesse in 1893. 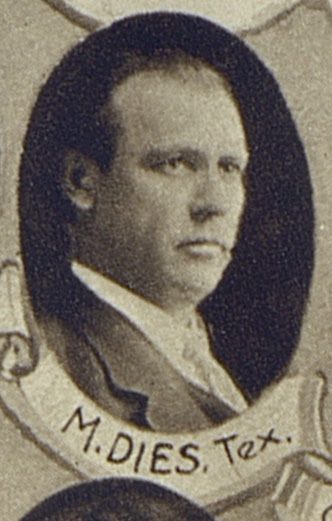 He served as a member of the Tennesee House of Representatives from 1892 to 1896, and served in the Tennessee Senate from 1902 to 1904. In 1905 he moved to Houston, Texas and continued to practice law. He was elected to the 63rd Congress, the 64th Congress, and the 67th through the 72nd Congresses. A Liberty ship, the USS Daniel E. Garrett, was named after him. 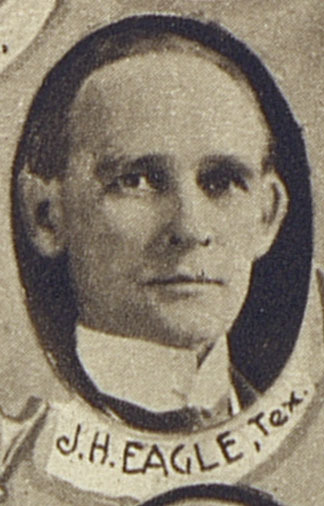 Alexander White Gregg (1855-1919) was born in Leon County, Texas. He attended Kings College in Tennessee and graduated in 1874. After graduation he studied law at the University of Virginia and was admitted to the bar in 1878. 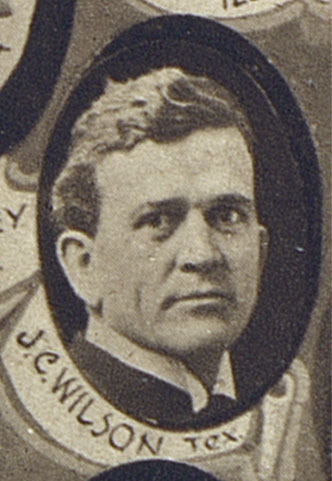 He served in the Texas Senate from 1886 to 1888. Following his time as a senator, he was elected to the House of Representatives and served eight consecutive terms, from 1903 to 1919. Rufus Hardy (1855-1943) was born near Monroe County, Mississippi. He attended private schools and graduated from the law department of the University of Georgia in 1875. After moving to Texas, he served as prosecuting attorney of Navarro County, District Attorney for the 13th Judicial District, and as a district judge from 1888 to 1896. 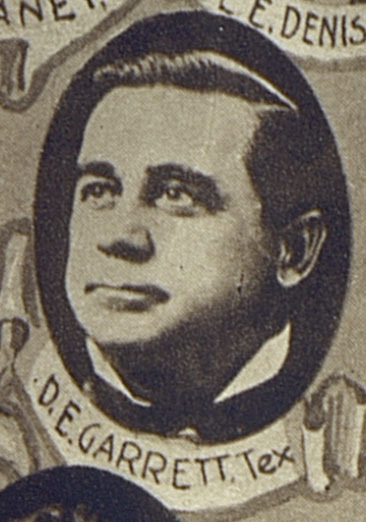 He was elected to the 60th Congress and the seven following Congresses (1907 – 1923). During his career he served as the chairman of the Committee on Expenditures in the Department of the Navy. After his congressional service, he resumed the practice of law. John Marvin Jones (1886-1976) was born in Cooke County, Texas. 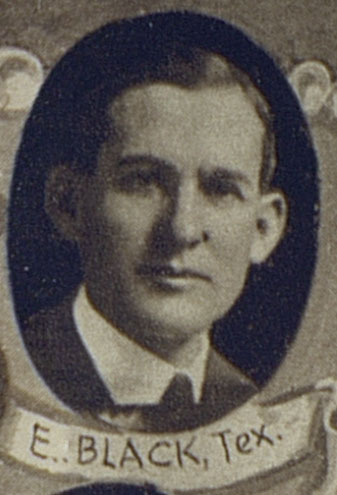 He graduated from Southwestern University in 1905 and the University of Texas in 1908. After passing the bar, he practiced law in Amarillo. He was elected to the 65th Congress — defeating the established incumbent John Hall Stephens. Jones was reelected for the following eleven Congresses where he served as chairman of the Committee on Agriculture. 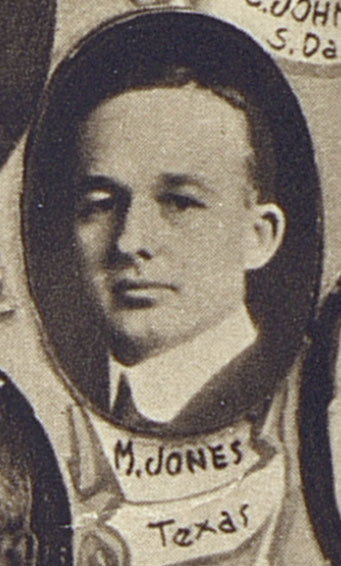 Jones remained in Congress until 1940 when he was appointed to become a judge of the United States Court of Claims by President Franklin D. Roosevelt. He later served as the chief judge of the court from 1947 to 1964. Joseph Jefferson Mansfield (1861-1947) was born in Wayne County, Virginia (now West Virginia) and moved to Texas in 1881. He was worked as a farm and nursery laborer and later as a baggage-master and freight clerk with the Southern Pacific Railway before studying law. He was admitted to the bar in 1886 and practiced law in Eagle Lake, Texas where he also established the first newspaper in that city. He became the prosecuting attorney of Colorado County in 1892 and served in that role until 1896. He then served as the ex officio county superintendent of schools from 1896 to 1910 and as the judge of Colorado County from 1896 to 1916. Mansfield was elected to the 65th Congress and to the fifteen succeeding Congresses. Atkins Jefferson McLemore (1857-1929) was born in Tennessee and moved to Texas in 1878. He worked as a cowboy, printer, newspaper reporter, and later as a miner in Colorado and Mexico. After he returned to Texas, he settled in San Antonio where he worked for a newspaper. He moved to Corpus Christi in 1889, to Austin in 1895, and to Houston in 1911 where he was in the newspaper publishing business. 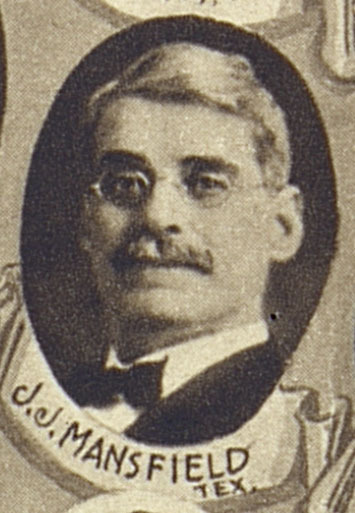 McLemore was elected to the Texas House of Representatives from 1892 to 1896 and subsequently was elected to the 64th and 65th U.S. Congresses (1915 to 1919). After his time in Congress he returned to newspaper publishing and resided in Laredo, Texas. Samuel Taliaferro Rayburn (1882-1961) was born in Tennesse in 1882 and moved to Texas in 1887 with his parents. He studied law at the University of Texas and was admitted to the bar in 1908. 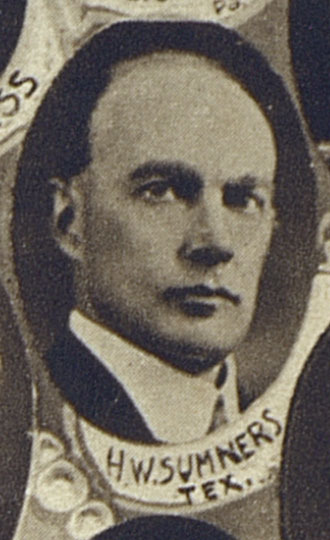 From 1907 to 1913 he served as a member of the Texas House of Representatives before he was elected to the 63rd U.S. House of Representatives in 1913. He served in the twenty-four following Congresses and was elected to serve as the Speaker of the House in 1940 — a position that he held for a record seventeen and a half years. James Luther Slayden (1853-1924) was born in Graves County, Kentucky. He attended school in Virginia and moved to San Antonio, Texas in 1876. 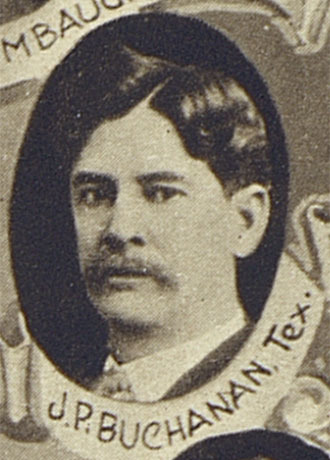 A cotton merchant and ranchman, he was elected to the Texas House of Representatives in 1892. In 1897, he was elected to the 55th Congress and was reelected for ten subsequent Congresses. In 1910 he was appointed by Andrew Carnegie as one of the trustees of the Carnegie Endowment for International Peace and he served as the president of the American Peace Society for several years. After his Congressional career he returned to managing his ranch and agricultural interests. Hatton William Sumners (1875-1962) was born in Tennessee and moved to Garland, Texas in 1893. There, he studied law in the office of the Dallas City Attorney and was admitted to the bar in 1897. He began practice in Dallas and was elected prosecuting attorney of Dallas County in 1900 where he served two terms. In 1912 he was elected to the 63rd Congress and to the sixteen following Congresses (1913 - 1947). During his time in Congress he was appointed to manage impeachment proceedings against several members of the Federal judiciary. In 1947 he returned to Dallas, Texas. James Clifton Wilson (1874-1951) was born in Palo Pinto County, Texas. 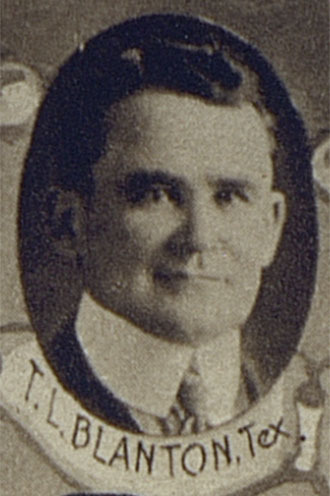 He attended public schools and Weatherford College before graduating from the law department of the University of Texas in 1896. He was admitted to the bar the same year and in 1898 he became the assistant prosecuting attorney of Parker County. 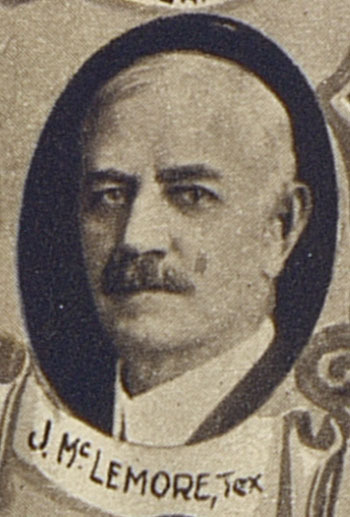 He later served as the prosecuting attorney from 1902 to 1908. 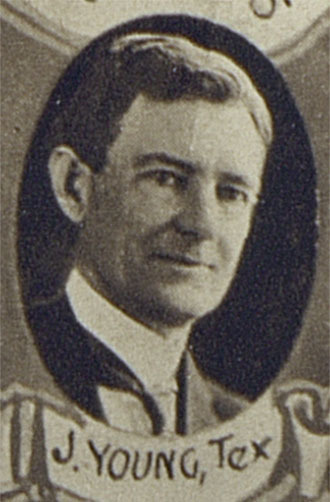 Wilson moved to Fort Worth in 1912 and served in roles as the Assistant District Attorney of Tarrant County and as the U.S. Attorney for the Northern District of Texas. 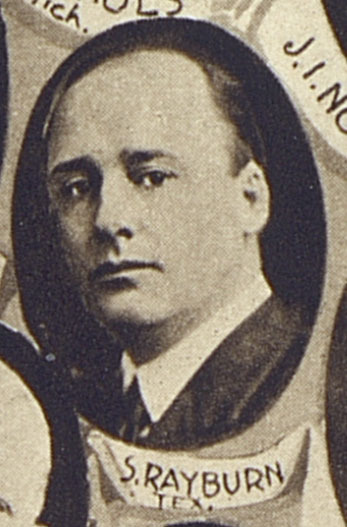 Wilson was elected to the 65th and 66th Congresses and served from 1917 to 1919. At that time he resigned and was appointed by President Woodrow Wilson to serve as U.S. District Judge for the Northern District of Texas. 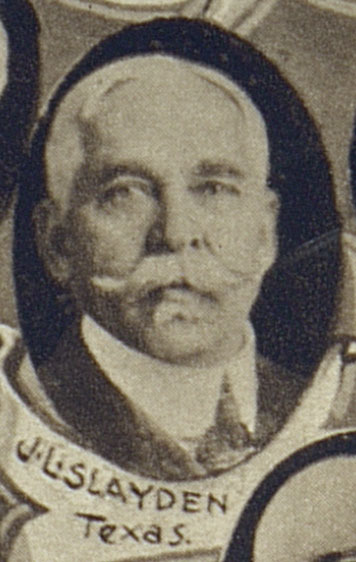 He served in that role from 1919 until his retirement in 1947. James Young (1866-1942) was born in Rusk County, Texas. He graduated from the law department of the University of Texas in July 1891. Young was admitted to the bar the same year and commenced practice in Kaufman, Texas. He was elected to the 62nd Congress and to the four succeeding Congresses (1911 - 1921). He declined to run for reelection in 1920 and returned to the practice of law. In 1931 he moved to Henderson, Texas and continued the practice of law until his retirement in 1937. The Tarlton Law Library is grateful to Hugh Brady, director of the Legislative Lawyering Clinic, for his generous donation.